The fight for the Formula E title 2017-2018 is over: Jean-Eric Vergne secured a fifth place in New York that made him the series’ newest champion while Lucas di Grassi won the race ahead of Daniel Abt and Sebastien Buemi. It is a given fact that Formula E provides its fans with lots of crazy and unexpected moments – and qualifying in New York City was definitely one of these moments! 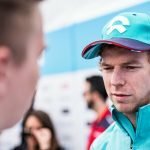 First, NIO Formula E’s Oliver Turvey unfortunately was forced to retire from any on-track action in Brooklyn as he injured his wrist in a heavy accident in FP2. And then, Sam Bird (DS Virgin Racing) only managed to secure a starting position outside of the top-ten while his championship rival Jean-Eric Vergne (TECHEETAH) looking like he was a safe bet for pole-position. But nothing is ever safe in Formula E and thus the Frenchman and his teammate Andre Lotterer were penalised and dropped to the back of the field due to a power over-use. So lots of excitement already in qualifying, so fans were hoping the first of two E-Prix in New York this weekend would be at least as eventful. And they were in for a treat! Things already got heated before the red light even went out, as Mitch Evans (Panasonic Jaguar Racing) turned up his engine too early, jumping a few metres forward and then stopping his car again. Unsurprisingly, once the lights went off, he barely got of line again, dropping to the end of the field quickly and having to retire from the race completely. Pole-sitter Sebastien Buemi (Renault e.dams) meanwhile got off the line very well, defending his lead against his teammate Nicolas Prost and Audi Sport ABT Schaeffler driver Daniel Abt, who used the advantage of his starting position on the right side of the track to quickly pass Evans and Jerome d’Ambrosio (DRAGON). The latter than ran into a lot of problems. Once he turned into the first corner, his teammate Jose-Maria Lopez hit him which resulted in both of the DRAGON cars being damaged. Just a few minutes later, both of them were told to come into the pits for repairs and thus dropped to the end of the field. Nearly as unlucky was championship leader Vergne who needed several laps to pass Stephane Sarrazin (MS&AD Andretti) and was thus in danger of losing touch with the top-ten. At the front, Abt showed a strong performance, first passing Prost for P2 and then taking the lead from Buemi on the sixth lap. 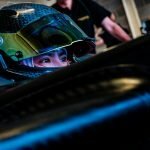 Just as impressive was the performance shown by Tom Dillmann, who took over Edoardo Mortara’s Venturi cockpit this weekend. Starting P9, the Frenchman quickly established himself in P5 and then started his podium pursuit. On the second lap, he already found a way past Prost and then gloriously defended his third position against di Grassi, who was putting a lot of pressure on the quick Frenchman. Unfortunately for the Formula E comeback driver, the Brazilian squeezed himself past Dillmann – making Audi Sport ABT Schaeffler a very strong rival for TECHEETAH in the teams’ standings. In the meantime, both Vergne and Bird made their way towards the top-ten and once Lotterer was able to pass the Brit, he was able to hold him up so that Vergne had a chance to catch up. On lap 16, the French TECHEETAH driver then overtook his championship rival on one of the straights and while he moved up to P7 before his car swap, the DS Virgin Racing driver remained on P10. In perfect Formula E fashion, things got crazy once the drivers headed into the pits to change into their second cars on lap 23. While Abt, di Grassi and Buemi returned onto the track in the same order, Dillmann lost a position to Nelson Piquet JR (Panasonic Jaguar Racing). The Brazilian’s joy was short-lived though, as he stranded on track just a few moments later. With both drivers out of the drivers’ championship, the Audi Sport ABT Schaeffler duo was not being gentle with one another. When squeezing past his teammate, di Grassi lightly hit Abt but both were able to continue and enlarge their gap to Buemi on P3. Much more civilized was the duel between Lotterer and Vergne for P5, as the German did not put up much of a fight against his teammate. With the race seeming to settle down as it was coming to an end, Alex Lynn (DS Virgin Racing) heavily hit the wall and impaled one of the barriers. This brought the Safety Car out onto the track and as repairs took some time, the race closed in on the 45-minute mark. Thus, when the Safety Car returned into the pits, about 2 minutes were left on the clock. While the order did not change at the front, Maro Engel (Venturi) caused some action when overtaking Prost and Bird for P8. In the end, Lucas di Grassi secured his second win of the season ahead of Abt and Buemi – but it was a bittersweet victory for the Brazilian as he had to pass on his Formula E crown to Jean-Eric Vergne, the new electric champion. 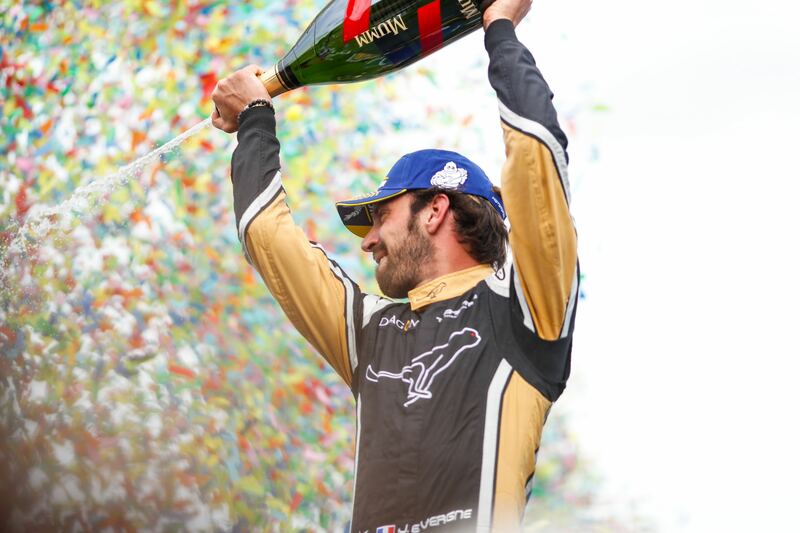 The Frenchman crossed the line in P5 while championship contender Bird did not score enough points with P9, thus making the TECHEETAH driver the first ever Formula E champion to secure his title prematurely.